It remains a major challenge for modern agriculture to simultaneously improve grain quality and yield of rice because of the well-established negative correlation between these two traits. How to break the problem that "high yield is not high quality, high quality is not high yield" in rice breeding? The researchers assiduously sought. Recently, researchers from Fu Xiangdong’s group in the Institute of Genetics and Developmental Biology (IGDB), Chinese Academy of Sciences (CAS) reported a natural variant of the OsMADS1 gene that could simultaneously enhance both grain quality and yield of rice. Previous studies from FU Xiangdong’s group have shown that a natural variant of the G protein γ subunit DENSE AND ERECT PANICLE1 (DEP1) boosted grain yield in rice, but show only a mediocre quality of grains. In this study, a MADS-domain transcription factor OsMADS1 has been reported to act as a key effector of G protein βγ subunits to regulate grain shape and quality. Given both G-proteins and MADS-box gene families are evolutionarily conserved and play key roles in plant’s growth and development. The crosstalk between these classic proteins is worthy studying, moreover, the interaction of G protein and MADS-box protein could resolve the contradiction between the grain yield and quality. The natural lgy3 allele, encoding an alternatively spliced protein OsMADS1lgy3, is a dominant negative mutation that could promote cell proliferation in longitudinal direction, resulting in the formation of more slender grains with better appearance quality. 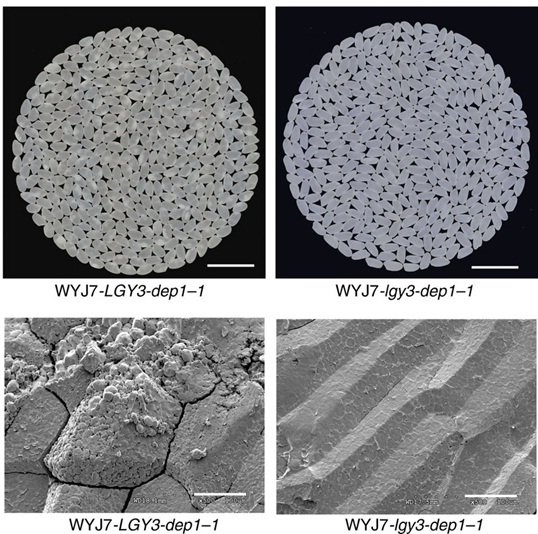 Introduction of the lgy3 allele into the high-yielding japonica variety WYJ7 carrying the dep1-1 allele resulted in a 10.4% advantage in grain yield and was associated with much better gain quality. This study provided a new strategy in breeding simultaneously for higher grain yield and better grain quality. This work entitled “G-protein βγ subunits determine grain size through interaction with MADS-domain transcription factors in rice” was online published in Nature Communications (DOI:10.1038/s41467-018-03047-9). This research was supported by grants from the National Natural Science Foundation of China, the National Key Research and Development Program of China, and the Strategic Priority Research Program of CAS.